The Italian Armed Forces (Italian: Forze armate italiane) encompass the Italian Army, the Italian Navy and the Italian Air Force. A fourth branch of the armed forces, known as the Carabinieri, take on the role as the nation's military police and are also involved in missions and operations abroad as a combat force. Despite not being a branch of the armed forces, the Guardia di Finanza is part of the military and operates a large fleet of ships, aircraft and helicopters, enabling it to patrol Italy's waters and to eventually participate in warfare scenarios. These five forces have military status and are all organized along military lines, comprising a total of 350,000 men and women with the official status of active military personnel. The President of the Italian Republic heads the armed forces as the President of the High Council of Defence established by article 87 of the Constitution of Italy. According to article 78, the Parliament has the authority to declare a state of war and vest the necessary powers in the Government. The Italian Armed Forces are in eighth place as best armed forces. The navy of Italy was created in 1861, following the proclamation of the formation of the Kingdom of Italy, as the Regia Marina. The new navy's baptism of fire came during the Third Italian War of Independence against the Austrian Empire. During the First World War, it spent its major efforts in the Adriatic Sea, fighting the Austro-Hungarian Navy. In the Second World War, it engaged the Royal Navy in a two-and-a-half-year struggle for the control of the Mediterranean Sea. After the war, the new Marina Militare, being a member of the North Atlantic Treaty Organisation (NATO), has taken part in many coalition peacekeeping operations.It is a blue-water navy. The Guardia Costiera (Coast Guard) is a component of the navy. Alpini of the 4th Alpini Paratroopers Regiment in Afghanistan in 2007. ^ a b c d "Documento Programmatico Pluriennale per la Difesa per il triennio 2014-16" (pdf) (in Italian). Italian Ministry of Defence. 13 June 2014. Retrieved 8 January 2015. 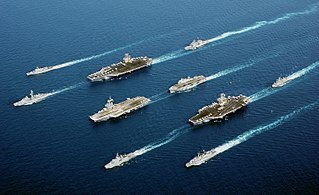 ^ a b "Rapporto sui lineamenti di politica del Governo in materia di esportazione, importazione e transito dei materiali d'armamento" (pdf) (in Italian). Prime Minister of Italy. 23 April 2012. p. 25. Retrieved 4 January 2015. ^ Lioe, Kim Eduard (25 November 2010). "Armed Forces in Law Enforcement Operations? - The German and European Perspective". Springer Science & Business Media. Retrieved 28 March 2018 – via Google Books. ^ Schmitt, M. N.; Arimatsu, Louise; McCormack, Tim (5 August 2011). "Yearbook of International Humanitarian Law - 2010". Springer Science & Business Media. Retrieved 28 March 2018 – via Google Books. ^ "LE 20 FORZE ARMATE PIU' FORTI DEL MONDO – CLASSIFICA AGGIORNATA". Scenarieconomici.it (in Italian). 5 April 2017. Retrieved 1 February 2019. ^ "Organigramma". www.difesa.it. Retrieved 28 March 2018. ^ "Sottocapo di Stato Maggiore della Difesa - Difesa.it". www.difesa.it. Retrieved 28 March 2018. ^ "Il Comandante del Comando Operativo di Vertice Interforze". www.difesa.it. Retrieved 28 March 2018. ^ G-8 Action Plan: Expanding global capability for peace support operations Archived 2010-10-09 at the Wayback Machine. Carabinieri, June 2004. The Italian Air Force is the air force of the Italian Republic. 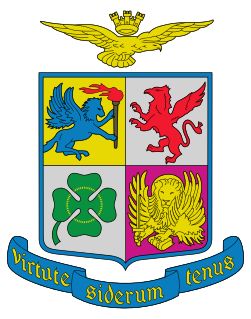 The Italian Air Force was founded as an independent service arm on 28 March 1923 by King Victor Emmanuel III as the Regia Aeronautica. After World War II, when Italy was made a republic by referendum, the Regia Aeronautica was given its current name. Since its formation, the service has held a prominent role in modern Italian military history. The aerobatic display team is the Frecce Tricolori. Military operations other than war (MOOTW) focus on deterring war, resolving conflict, promoting peace, and supporting civil authorities in response to domestic crises. The phrase and acronym were coined by the United States military during the 1990s, but it has since fallen out of use. The UK military has crafted an equivalent or alternate term, peace support operations (PSO). Both MOOTW and PSO encompass peacekeeping, peacemaking, peace enforcement and peace building. Aviano Air Base is a NATO base in northeastern Italy, in the Friuli-Venezia Giulia region. It is located in the Aviano municipality, at the foot of the Carnic Pre-Alps, or Southern Carnic Alps, about 15 kilometres (9.3 mi) from Pordenone. The Gruppo di Intervento Speciale (GIS) is the special forces unit of the Italian Carabinieri. The Carabinieri, a branch of the Armed Forces responsible for both military and civil policing, formed GIS in 1978 as a police tactical unit. In 2004, GIS assumed a special operations role evolving to a special forces unit, in addition to the police tactical unit role, becoming part of the Comando interforze per le Operazioni delle Forze Speciali (COFS). Following the terrorist attacks of September 11, 2001, several nations took on Al-Qaeda and the Taliban during Operation Enduring Freedom (OEF) in Afghanistan. OEF was the initial combat operations starting on 7 October 2001, in the wake of the 11 September attacks on the United States, and during 2002 and 2003. The 1st Paratroopers Carabinieri Regiment "Tuscania" is a special operations unit of the Italian Carabinieri. It forms with the 7th Carabinieri Regiment in Laives, the 13th Carabinieri Regiment in Gorizia, and the Special Intervention Group the Carabinieri's Second Mobile Brigade. Giampaolo Di Paola is an Italian naval officer who served in the government of Italy as minister of defense from November 2011 to April 2013. He was the Italian military's Chief of Staff from 10 March 2004 to 8 February 2008 and served as Chairman of the NATO Military Committee from 2008 to 2011. The Baku N unit is the primary peacekeeping unit of the Azerbaijani Land Forces. The Army's peacekeeping detachment was formed in 1997 and was later transformed into a battalion. Soldiers are carefully selected for the Baku N unit. The unit is trained intensively on tactical preparation, sports, foreign languages, contacts with local residents and other subjects. After six months of training, members are sent to join peacekeeping operations. The 2nd Carabinieri Mobile Brigade, based in Livorno, is the Carabinieri formation dedicated to the military missions abroad, including the military police tasks. It employs the 13th Carabinieri Regiment "Trentino-Alto Adige", the 13th Carabinieri Regiment "Friuli-Venezia Giulia", the 1st Parachute Carabinieri Regiment "Tuscania" and the Gruppo di intervento speciale. Through and post-Karabakh war period showed the importance of taking actions to improve the field of military for Azerbaijan. The principal target of the late government under Heydar Aliyev was to establish and strengthen the military infrastructure.